Each NFL team has the pre-season goal of winning their division. How they do it, however, may be less of a concern. Case in point: Take a look at today’s division standings. Among the undefeated, division-leading Carolina Panthers and New England Patriots are the 5-5 NFC East division-leading New York Giants and a pair of 5-5 teams, the Indianapolis Colts and Houston Texans, sitting atop the AFC South. With seven weeks remaining in the 2015 campaign, there is a legitimate question (or maybe better stated, a concern) about whether or not a sub.-500 team will win a division title this year. Of course this would not be something new; in fact, the currently-unbeaten Panthers won the NFC South last year with a 7-8-1 record. They became the second team in league history to win a division title with a losing record… the Seattle Seahawks won the NFC West in 2010 with a 7-9 record. Going back in NFL history 25 teams have won division titles with a winning percentage under .600. Here’s a breakdown of those teams. As you probably noticed, the Seahawks have five of the 25 spots in the above list. They did it twice in the AFC West and three times in the NFC West. The Bengals, Vikings, Bucs and Browns each were listed twice. If the AFC South champ this year finishes with a winning percentage under .600 it will be the first time for that division. It has happened six times in the NFC West, five times each in the AFC Central and NFC Central, four times in the AFC West, twice each in the AFC East and NFC South, and once in the NFC East. One final note: Of the 25 teams, three were able to overcome a mediocre regular season and advanced to the Super Bowl that year. In 1979 the L.A. Rams won the NFC West with a 9-7 record and then lost to the Pittsburgh Steelers 31-19 in the Super Bowl. Fast forward to 2008 when the Arizona Cardinals won the NFC West with a 9-7 record and then lost in the Super Bowl that year to the Steelers 27-23. The only team to win the Super Bowl after winning a division title with a winning percentage under .600 was the 2011 New York Giants. 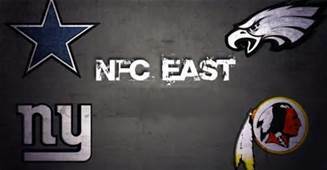 Although this wasn’t the most favorable NFL prediction, they won the NFC East with a 9-7 record and then won four straight in the playoffs to win the Super Bowl over the Patriots. Of the first 14 teams (prior to 2000) to win a division with a winning percentage under .600 only three won a playoff game that year. Of the last 11 teams (since 2000) to win a division with a sub-.600 mark, eight won at least one playoff game that year. For more NFL insight/predictions, visit TheMachinesPicks.com.